BEFORE: The People vs. George Lucas is the next in a long chain of documentaries. Since Star Wars deals with space, I’d like to take a moment and congratulate NASA and the team that worked on the Curiosity rover. It certainly is a historic day today. 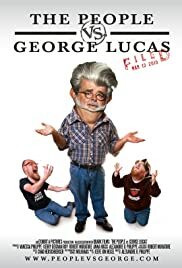 AFTER: Every fan of Star Wars has their own opinion about the prequels, Lucas’ edits to the original trilogy, and whether or not Jar Jar Binks really exists. This documentary aims to be the definitive collection of all these opinions and the arguments to support them. While the focus is mainly on how the prequels are bad, Han shot first, and midichlorians ruin the idea of the force, the opposite viewpoint is also represented. As someone who has thought about these issues a lot and discussed them with other fans, I found the opinions in this documentary to be very interesting. I found myself thinking about the films in different ways and who should have control over the films; the creator or the fans? The most interesting idea I found was about what the original 1977 Star Wars, really meant. Star Wars won six Academy Awards: Best Art Direction, Best Costume Design, Best Film Editing, Best Visual Effects, Best Original Score, and Best Sound. The remastered, special edition versions changed many things from the original including the special effects and the film editing that won the Academy Award. Many fans, myself included, argue that these changes would not warrant the Academy Award. I’m not saying all the changes are bad. In fact, I think inserting more vehicles, people, animals, etc. in wide shots adds value to the film by creating a more detailed universe. But when you change the explosion of the Death Star and who shoots first in the cantina, the story is altered and history is rewritten. Star Wars was made in 1977 and is a reflection of what films were like at that point in time. The film won Best Visual Effects despite the fact that you can see the rotoscoping around the tie-fighters in space, and the limitations of working with physical models and by changing that for the remastered version, Lucas took away a snapshot of film history. I do see the opposite argument made in the documentary that the films belong to Lucas. They’re his works of art and he should be able to do what he wants with them. I’ll leave it to you to watch the documentary yourself and make/refine your own opinions. As a documentary, it was highly thought-provoking and fairly well structured. It did lack a real narrative behind it, similar to Tales From the Script. In other words, you could really go to any point in the film and not be lost; it’s all an amalgamation of a bunch of thoughts just jumbled together around a central premise; George Lucas, Star Wars, fans, and their relationship. It did benefit from having b-roll, or video inserts, to help visualize some of the points being made. For any Star Wars fan, it connects you with other fans and makes you challenge your own thoughts and beliefs about the franchise. For a non-Star Wars fan, shame on you. Go watch those movies right now.